Draw your cutlass and set sail for adventure! For thousands of years pirates have captured the imagination, their rough-and-tumble lives filled with a boundless lust for blood, gold, and glory. Being a pirate is the ultimate freedom - freedom to take what you want and never apologize. Whether from the decks of massive slave galleons or beneath the sails of swift ships, pirates hunt the seas, singing chanteys and hoisting the Jolly Roger as they seek out the next unsuspecting merchant. They are the wolves of the sea, and their hunger can never be sated. 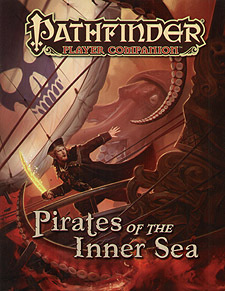 Whether you want to abandon the life of a landlubber to join a pirate crew, hunt down their murderous ships in the name of justice, or simply follow a mysterious map to buried treasure, Pirates of the Inner Sea has everything you need to know about piracy on Golarion, all of it one hundred percent player-friendly and ready to guide you on your journey. In-depth overviews of six major pirate organizations in the Inner Sea region, including the government-backed privateers of Andoran, the slavers of Okeno, the high-seas buccaneers of Riddleport and the Shackles, and the quick-moving brigands of the River Kingdoms. Each entry details the pirates' history, notable captains, activities and hideouts, preferred ships, and more. Pages of new pirate weapons and equipment, from book hands, cutlasses, and tar bombs to peg legs, treasure chests, and grog. New pirate archetypes for several different classes, including the buccaneer bard, the freebooter fighter, the corsair ranger, and the smuggler rogue. A detailed look at the faith of Besmara the Pirate Queen, goddess of all those who make their living spilling blood on the water. New pirate-themed spells for casters of numerous types and faiths. New character traits to help you customize your pirate character mechanically as well as thematically. Sample pirate codes, minor pirate groups, a timeline of important pirate events, and more! This Pathfinder Player Companion is intended for use with the Pathfinder Roleplaying Game and Pathfinder campaign setting, but can easily be used in any fantasy game setting. In addition, it is particularly useful for players of the Skull & Shackles Adventure Path.